TAMPA, Fla. (AP) — Goaltender Anders Lindback had a solid performance against a familiar opponent. Lindback won in his first game against his former team, Alex Killorn had a goal and an assist, and the Tampa Bay Lightning beat the Nashville Predators 4-2 on Thursday night. "It’s always nice to get a win, especially against the old team," said Lindback, who made 28 saves. "It’s always a little special." 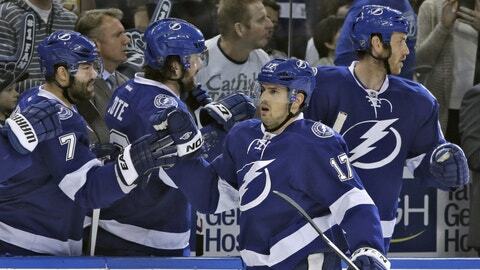 The Lightning also got goals from Martin St. Louis, Teddy Purcell and Richard Panik. Lindback stopped six shots, including a pair of quality chances by David Legwand, during a two-minute stretch late in the first period. Tampa Bay acquired Lindback in a trade with Nashville on June 15, 2012. "I know for him it was a big game," Killorn said. "It’s the one he circled on the calendar. He played awesome." Craig Smith had two goals for the Predators. Matt Cullen assisted on both of Smith’s goals. "They’re playing good hockey," Nashville coach Barry Trotz said of Tampa Bay. "They play a real high-pace game." Killorn put the Lightning up 1-0 when he beat Carter Hutton from the right circle 2:25 into the game. Defenseman Victor Hedman and Jean-Philippe Cote assisted on the goal. Hedman was back in the lineup after missing the previous six games because of a lower-body injury. Cote, recalled Wednesday from Syracuse of the AHL, got his first career point playing in his first NHL game since an eight-game stint with Montreal during the 2005-06 season. The Lightning are 15-1-1 when scoring the first goal of the game. Nashville dropped to 3-15-1 when its opponent scores first. "We’ve been finding out in this league getting the lead is huge," Lightning coach Jon Cooper said. St. Louis made it 2-0 during a power play at 19:06 of the first. Tampa Bay had scored with the man advantage in just four of its previous 22 games. After Smith cut the Nashville deficit to 2-1 at 6:36 of the second, Purcell put the Lightning back up by two 1:51 later. Nashville got within 3-2 when Smith scored a power play with 6:58 left in the second. Tampa Bay again quickly responded on Panik’s goal just 49 seconds later. "That’s not good," Smith said. "Takes the momentum away from you." Hutton was pulled after Panik’s goal and replaced by Marek Mazanec, who stopped all 19 shots he faced. Hutton gave up four goals on 14 shots on his 28th birthday. NOTES: Injured Lightning star Steven Stamkos moved into his second week of on-ice work, spending over 30 minutes skating end-to-end, shooting and doing stick-handling drills. The center, who broke his right leg Nov. 11, hopes to return in February. … Lightning LW Ryan Malone (chipped ankle bone) had a light on-ice workout. … Nashville F Filip Forsberg, sidelined by a concussion, has been assigned to Milwaukee of the AHL. … Predators C Colin Wilson was scratched.